Brazilian Jiu Jitsu can have more benefits than you know! 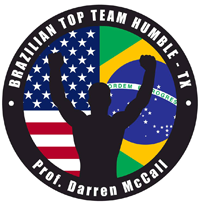 McCall Mixed Martial Arts exists to help each student learn and develop a love for MMA and Brazilian Jiu-Jitsu. We provide the The Woodlands TX area with a dojo that is positive, safe, clean, and professional. It's an area that they can come to and receive quality instruction from experts who can help them develop lifelong skills and techniques in the martial arts. Our school and instructors also aim to train and teach each student the techniques that will help them grow in their self-defense skills, or in a martial arts competition. Hopefully, you'll develop a love for the sport like we have! Brazilian Jiu-Jitsu originated in the early 1900s in Brazil, although it was by way of Japan. In the early 1900s, Esai Maeda, a former Jujutsu champion in Japan who was now leader of a Japanese immigration convoy assigned to Brazil, befriended Gastao Gracie and taught his son Carlos. Carlos and his brothers, in turn, opened their martial arts school in 1925; his younger brother Helio adjusted the techniques to account for his smaller frame, and thus Brazilian Jiu-Jitsu was born! Helios' son eventually brought Brazilian Jiu-Jitsu (BJJ) to the United States in the 1980s, and it has been growing in popularity ever since then. Unlike other martial arts styles, BJJ teaches a smaller person ways they can defend themselves against a much larger opponent. While standing combat is also prevalent, this style is best known for its numerous chokes, holds, joint locks, and other manipulations designed to overpower an opponent. We have qualified instructors (5 years and more training experience) teaching all of our classes - and most classes are taught by a Black Belt! Children will learn Brazilian Jiu Jitsu martial arts self defense skills in a disciplined environment. Self defense skills are taught on their feet and on the ground. How to handle bullies without violence is taught. The danger of strangers are covered. Being a Martial Artist also means being a better student. Every child learns to follow directions, pay attention in class and participate in class activities. These skills help them to become better students; therefore, better grades. Coordination, weight loss, fitness, strength development will occur. Confidence and self-esteem will increase and they will learn to control their anger and release it in a positive manner. They will learn to be disciplined, to show respect, and have integrity. Leadership skills will be taught and developed for future use. They will learn to focus and concentrate since BJJ is a thinking sport and this will help them focus in school. Seriously Considering Brazilian Jiu Jitsu near The Woodlands TX? Contact Us Today! If you live in Houston, Humble, Kingwood, Channelview, Atascocita, or the surrounding area and are looking for martial arts classes to join, look no further than McCall Mixed Martial Arts. We are a family owned and operated studio run by black belt experts. Our classes are available for all ages; kids, teens, and adults. It doesn't matter if you've had any experience, there's always somewhere to start at McCall! If you're looking for professional martial arts classes for yourself or for your child, contact us today and we'll put a plan together that will fit your needs and budget. "I was looking for a reasonably priced place to learn martial arts and get in shape. I found McCall MMA online and decided to give it a try. They teach muay thai and Brazilian jiu-jitsu, have adult and kids classes. I ended up signing up for jiu jitsu and its been 4 years of training at McCall now. The coach and his wife are amazing people. Many nights I have seen the Coach, Darren, just working with students after most everyone has left going over and over technique with someone till all their questions are answered. Your teammates here are like a second family. There's a good mix of males and females. Everyone is welcome here and egos are checked at the door. So not only are you able to get good training and practice in, this gym is a place you look forward to getting beat up in!" If you're interested in taking your martial arts to the next step, or you'd like to see what the hype is all about - give us a call at (823) 375-9608! We know you'd be able to grow from our Brazilian Jiu-Jitsu classes. If you're in the greater The Woodlands TX area, we'd love to see you stop by!